A fun-filled day for the entire family is coming to Westchester County! One of the largest family events is coming to Pace University’s Goldstein Fitness Center on Saturday, March 23rd. No matter the age, there will be plenty of activities for all members of the family to enjoy! You will have the opportunity to play with small and friendly animals, support live and local entertainment, and so much more! The Hillside Food Outreach will be accepting non-perishable food donations throughout the day. Kids can enjoy an obstacle course and inflatables from Party Time Rentals while parents have the opportunity to scope out several educational vendors. Some of your favorite WHUD jocks – Mike & Kacey, Tom Furci, Andy Bale and Susan Browning will be broadcasting live on-air all day! Also, stop by our very own kids radio station! Admission for 13 and under is free, adults are $10. 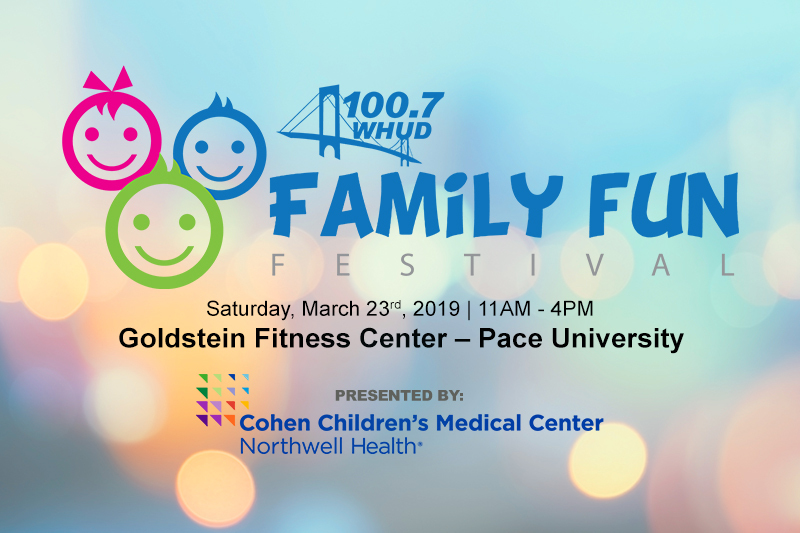 Swing by the Family Fun Festival at the Goldstein Health, Fitness & Recreation Center at Pace University in Pleasantville from 11am to 4pm on Saturday, March 23rd and enter for your chance to win a brand new Nintendo Switch! See you there! *Wake up and start your day with Mike & Kacey on 100.7 WHUD! They will get you through your busy morning with your favorite music, chances to win great prizes, news updates twice each hour, four traffic reports each hour and the area’s most accurate weather forecast. Spend your mornings with Mike & Kacey on 100.7 WHUD! *100.7 WHUD: “Playing One Great Song After Another” in Westchester, Rockland, Orange, Dutchess, Putnam, & Ulster counties.